Over the years, Hollywood has spent treasured time focusing on the theme of The Olympics. 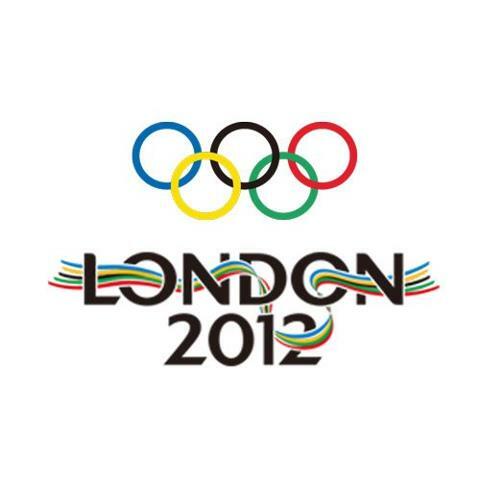 I’ve decided to select three favorite films with the Summer Olympics as a backdrop. They may not be the best ever produced, but they still resonate in my memory as I was growing up. 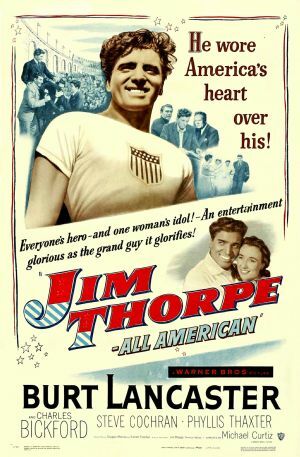 ~ JIM THORPE, ALL-AMERICAN – A largely fictional bio-pic created at Warner Brothers, it was enjoyable due to the direction of Michael Curtiz, and masculine portrait created by Burt Lancaster. Thorpe was arguably the greatest athlete of the first fifty years of the 20th Century. He was a Native American who thrived at the 1912 Summer Olympics, winning medals with astounding ease. The movie features archival footage of both the 1912 and 1932 Summer Olympics, as well as, other footage of the real Thorpe (seen in long shots). Charles Bickford played the famed coach… Pop Warner, Thorpe’s longtime mentor. Bickford also narrates the film. Phyllis Thaxter and Steve Cochran also co-star in the movie. The legendary sports figure entered the 1912 Olympics and won both the pentathlon and the decathlon. However, when it’s discovered he was paid to play minor league baseball, he’s stripped of his medals and trophies, and his amateur status is revised. It has the typical Hollywood ending as Jim Thorpe is inducted into the Oklahoma Hall of Fame. 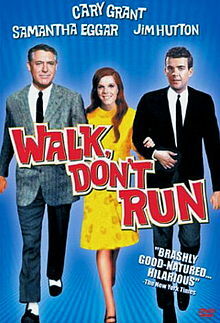 ~ WALK DON’T RUN – Essentially a remake of the 1943 classic The More the Merrier, the motion picture is set in Tokyo during the Olympic Games in 1964. The movie marked the last screen appearance by Cary Grant. Samantha Eggar and Jim Hutton offered reliable support. A standout is the score created by Quincy Jones, and snappy tunes co-written by Peggy Lee. 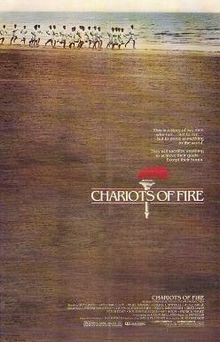 ~ CHARIOTS OF FIRE – Nominated for seven Academy Awards, it won four Oscars, including Best Picture. It’s ranked 19th in the British Film Institute’s list of Top 100 British films. The original phrase chariot(s) of fire is from 2 Kings 2:11 and 6:17 in The Bible. The motion picture tells the fact-based story of two athletes in the 1924 Olympics: Eric Liddell, a devout Scottish Christian who runs for the glory of God; and Harold Abrahams, an English Jew who runs to overcome prejudice. The British team returns home triumphant. As the film ends, onscreen text explains that Abrahams becomes the elder statesman of British athletics. Eric Liddell went on to missionary work in China. Scotland mourned his death in Japanese-occupied China during World War II. Vangelis wrote a memorable score that captures the stirring imagination of the British import. Five lively Gilbert and Sullivan tunes also appear in the soundtrack. Chariots of Fire has been a popular theme in promotion of the 2012 Summer Olympics in London. And, this iconic music was used as a fanfare for the carriers of the Olympic flame on parts of its route through the United Kingdom. A Blu-ray of the film was released on July 10th in the United States, and July 16th in the UK. A new digitally re-mastered version was recently screened in 100 cinemas across the pond. This entry was posted on Wednesday, July 25th, 2012 at 3:38 am	and is filed under Blog by Manny Pacheco. You can follow any comments to this post through the RSS 2.0 feed. Responses are currently closed, but you can trackback from your own site.